You are warmly welcomed to join the movie night by V2V Program of Lap-Chee College. 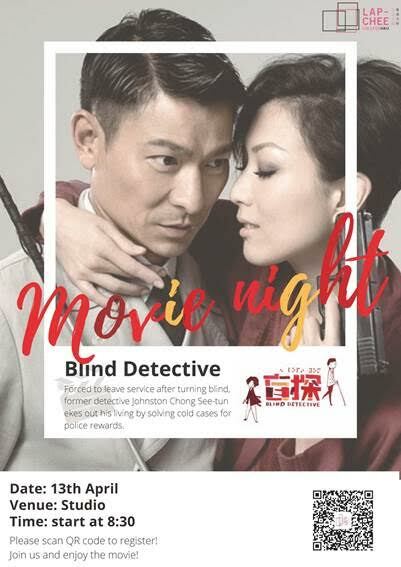 Forced to leave service after turning blind, former detective Johnston Chong See-tun (Andy Lau) ekes out his living by solving cold cases for police rewards. During a case involving the search for the culprit who throws acid off roofs, he meets an attractive hit team inspector Goldie Ho Ka-tung (Sammi Cheng). When Ho notices Johnston’s impressive investigative mind despite lack of vision, she enlists his help in a personal case she is unable to solve on her own. The two work together to solve the case as well as other cold cases.